Snow Blows, Myers says jokingly. All this bad weather has made it impossible for us to get shipments of new inventory. In the past few months weve been selling cars like theyre going out of style. says Myers. Im not about to let the bad weather slow us down so Im forced to do something drastic in order to keep inventory levels high and maintain momentum. Wacky winter weather across the nation has stalled car sales for many car dealers just when things started looking up for the downtrodden industry. Heavy snowfall across the country has grounded vehicle shipments and left dealers in a lurch. The unusual weather has also kept dealers from being able to travel to auto auctions to replenish their vehicle stock. Winston-Salem car dealers have not been spared but one local dealer isnt taking the problem lying down. Tracy Myers, owner of Frank Myers Auto Maxx, says hes up for the challenge and isnt going to let a silly thing like snow steal his momentum. Myers is bound and determined to sell cars (and get cars) even if that means losing some money to keep the momentum going and to make sure his staff stays busy. 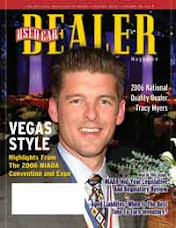 My grand plan to get fresh inventory despite the logjam at the auction will benefit you and the community in a big way, Myers explains. Anyone that buys ANY Certified vehicle from us, Im going to pay off their trade...no matter how much they owe. This is the only way I can think of to get the cycle flowing. It doesnt matter what make or model youre driving or how old the vehicle is. It doesnt matter how many payments you have left. Vehicles are needed and dealership personnel are pulling out all the stops to keep the inventory levels at a normal level. Its a bold move and an amazing opportunity only available for the next 27 days at Frank Myers Auto Maxx. Frank Myers Auto Maxx will pay off your trade when you buy ANY of their Certified vehicles regardless of your payoff amount. This makes it the perfect time for you to upgrade to a nicer, newer vehicle and it puts more cars on Uncle Frank's lot. And he looks at it as the ultimate win/win scenario. Is it the best option for us? No, says Myers. In fact well probably take a loss on some of the cars we pay off but its better than losing momentum and having a lot that looks empty which we know will drive away customers. Myers assures us that there are plenty of vehicles to choose from right now. But he doesnt want his inventory to get so depleted that the dealership looks bare because thats bad for business. Myers says that credit challenged buyers can thank Jack Frost for a better than ever chance of being approved for a nicer, newer vehicle. Due to this weird weather were doing what ever it takes to continue to sell cars. Im pulling out all the stops and cashing in all my favors with the banks and lending institutions. Ive pre-notified them that Im going to need their help to keep the momentum up and they are willing to help. My EVERYBODY RIDES Program will be in full swing, explains Myers. The EVERYBODY RIDES" Program is a program thats only available at Frank Myers Auto Maxx. Its a consumer focused credit approval process that takes the person into consideration not just their financial statistics. Its the personal approach to lending that so many financial institutions have forgotten about. Ive put humanity back in the credit process and its working amazingly well for us. I believe if you take care of people, theyll take care of you. Thats why my "EVERYBODY RIDES" program works when everyone else cant get the job done, boasts Myers. Bad credit or good, Myers is making it hard to resist the temptation to get out of your old car and into a nicer, newer one. They are ready to pay off your old car no matter how much you own on it. Perhaps the old saying is true, even a snow cloud has a silver lining. Because of the nature of this exclusive opportunity Myers expects that hell be successful and momentum will actually increase. He suggests scheduling a VIP test drive by calling 866-242-1277 or visit Frank Myers Auto Maxx at 4200 North Patterson Avenue in Winston-Salem, NC and mention you saw this video on YouTube for priority access to one of his Non-Commissioned Sales Pros. •Frank Myers Auto Maxx needs to buy more cars, so theyll pay off your current loan or lease in full when you buy ANY of their Certified vehicles. •Only at Frank Myers Auto Maxx.